Report on the “Energy at Work – Fighting Fatigue” lunchtime CPD talk given for business matters by Amanda Hamilton on 23rd April 2015.
business matters is grateful to Brodies LLP for the use of their conference room for this talk and for the working lunch provided for those attending. 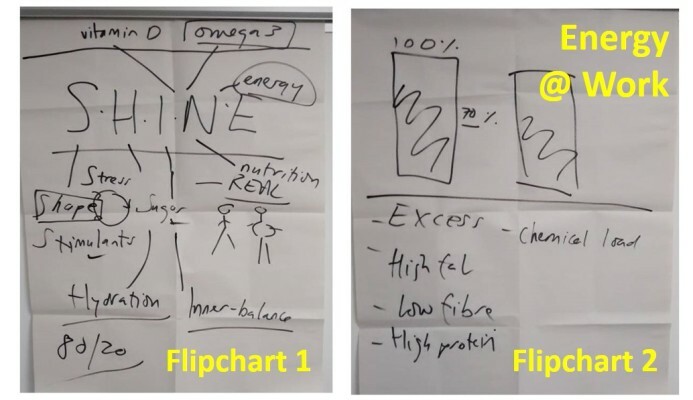 Images of the flipcharts that Amanda used to illustrate her talk are available below, a recording (39 minutes) of Amanda’s talk can also be accessed along with a recording of the Q&A session (8 minutes). Amanda gave this talk as part of the “Resilience @ Work” series of CPD lunchtimes. With her background as a nutritionist, broadcaster and author, she was at pains to point out that she was, first and foremost, a busy working Mum with the demands and difficulties that can present, having been up at 3am with a sick child prior to coming along to address us. In those situations, she admitted, a strong latte can be essential! She started by promising to talk through, quite broadly, some of the basic principles on nutrition and energy, and to address how to improve and sustain our resilience. She outlined her own background in the media news area, the fact that she had studied nutrition to degree level and beyond and the realities of working across a number of countries on a routine basis while trying to stay healthy while all of this was going on. Continuing to set the background Amanda highlighted the fact that, as many of us will recognise, when we are stressed in our work, we have a natural tendency to reach for a “quick fix” in what we eat and, very often, that will not be a healthy option. Attempting to make the topic accessible, Amanda stated that she was going to base her talk around the acronym S.H.I.N.E. – shine – a positive word reflecting energy and good health! As she developed her talk she created two flip charts which can be accessed below. S – covering Shape, Stimulants, Sugar and Stress. Amanda encouraged our involvement by asking what we had eaten for breakfast – one person’s almond croissant and coffee ticked the Sugar and Stimulants boxes right away! The four “Ss” are all interlinked in a cycle. The Shape that we are in is reflective of how we live. Amanda refused to endorse any conventional wisdom on ideal shape (more often expressed as size). Her advice was to try to be human shaped but she emphatically stated that the all-too-common “weight round the middle” shape was not good and should be seen as a warning, health-wise. That weight is “new” weight, only evident in the population over the last few decades as our diet has moved away from hunter-gatherer, whole-food based to refined foodstuffs. Weight around the middle can also be an indicator of stress. Amanda explored how fat works, highlighting the differences between subcutaneous and visceral fat. We need subcutaneous fat and it is healthy. Visceral fat, on the other hand, is an endocrine organ and, as such, its activity can predispose us to conditions associated with inflammation, type-2 diabetes and many of the lifestyle diseases seen in the Western world. She mentioned a study, published on the morning of the talk, which had highlighted that the obesity crisis was not associated with lack of exercise but was directly linked to diet. Stress, particularly chronic, day by day stress, increases the production of cortisol and this is not healthy. Humans are programmed to deal well with intermittent, even quite severe stress – the Fight or Flight, Rest and Digest way of life. However being “always on” doesn’t allow our body to relax from stress. This is exacerbated by Stimulants and the way they are often used to keep going in an “unnatural” way. The mechanism by which cortisol works is to make the body think that it is under threat and to encourage it to store energy in response to that threat – laying down fat near the engine of the body – around the middle! Aim for exercise to combat this – not necessarily a gym session but “active rest” – walking, talking, communication, community. When you are stressed you are more likely to reach for Sugar – a quick fix. If you are well nourished this is much less of a drive, but beware of Stimulants such as tea and coffee which can keep you in the perpetual cycle of “stress, eat, stress, eat”. Limit your intake of coffee and don’t have too much too late in the day as it can disrupt your sleep cycle. Moving on to hydration, Amanda asked for examples of what people drink during the day. She indicated that the only dehydrating drink is alcohol but urged caution with tea and coffee which are Stimulants (above). We also need to be aware and regard milk more as a food than a drink. Staying hydrated is really important for mental performance, with proven decreases in concentration ability if you are dehydrated. Dehydration can be confused with hunger and may lead to unnecessary eating. It is often caused more by what we eat rather than what we don’t drink. If our diet is high in processed food, containing salt, sugar, preservatives then that does not help. Optimally we should keep a bottle of water visible and accessible at all times – sip rather than gulp and avoid too much water at mealtimes which can hinder the digestive process. Water is the key element in hydration. Amanda said that she likes to look at this from the gut perspective as it has a huge effect on the body’s immune system. The gut is known as the “enteric nervous system” – that’s why we feel emotions in our tummy. Digestive health can affect your mood. Amanda highlighted the high percentage of our total reserve of daily energy expended each day on the digestive process – around 70%. We should aim for easily digestible meals so that we lessen the demands on our body’s digestive process. Overeating, high fat, low fibre, high chemical load (processed foods) – all of these can contribute to making things difficult for our digestive systems. The key thing to note is that the nutrient balance has to be correct – the body seeks out nutrients not calories and so you can have the situation where you have eaten a huge number of calories but your body is still “hungry”. It is possible for someone to be morbidly obese and clinically malnourished at the same time. Amanda recounted a documentary program which she had made on the health effects of the “typical” British diet – with some surprising results – dispelling some myths and bringing clarity in the area of calories and balance of diet. She suggested looking to the typical Asian meal as a good example of a healthy diet from the point of view of the ideal proportions for the constituents in a meal – the right amount of protein is approximately the size of your palm, you should have lots of fibre from, for example, vegetables and a fist-sized portion of carbohydrate. The key principle here is “keep it real”. A non-processed whole-food diet is good – for example porridge oats, yogurts, fruits, oatcakes etc. Also Amanda encouraged us to consider appropriate vitamin supplements along with omega-3 fats from oily fish for example or, to a lesser extent, from nuts and seeds. Keep to high fibre, relatively low sugar diets. She did, however, encourage us with the comment that the 80:20 rule applies and that, providing our basic diet is healthy, the occasional slice of cake or glass of wine does no harm whatsoever. Feed yourself well and then go and have a treat! Amanda said that the simple thing to say about this is that, if we get ourselves in “human” Shape, get a handle on Sugar and Stimulants, stay Hydrated, ensure that our Inner Balance (digestion) is in good shape and keep our Nutrition in the correct balance then the Energy basically takes care of itself. Good health should not be a battle if the building blocks are in place. Amanda concluded her talk with a lively Q&A session. Her talk was very well received, and people left aiming to put the theory into practice.